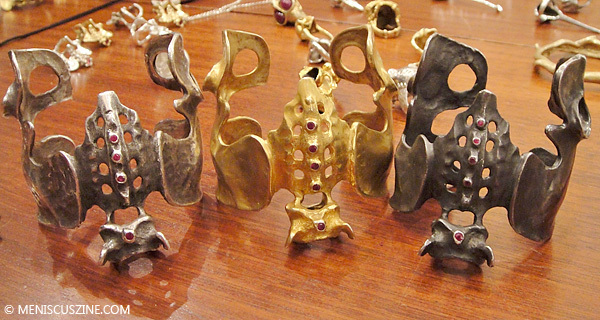 Heidi Gardner’s collection of skull rings and vertebrae bangles enticed viewers to pick them up and play with them like little toy dolls at the Holiday Trunk Show held at Greenwich Village boutique SUCRE. However, constructed with silver and brass – and studded with ruby eyes and diamond nostrils – these creatures were not ordinary toys. “Each of them has a name and a story,” Gardner told Meniscus Magazine of her latest Creature Couture collection. “I have a really dark imagination.” This inspiration partly stems from what the Buffalo, N.Y., native described on her website as a strict childhood bound by the regulations of her boarding school years and ensuing desire to translate her imagination into a jewelry line. Coupled with her training as a ballerina and background as an artist, the elaborate details in Gardner’s exquisite collection include meticulously engraved bones and joints. Far from being grotesque, the intricacies imbued in each piece of jewelry make the collection hauntingly beautiful. Gardner’s fascination with the human form was especially evident in her gold plated pelvic rings studded with different color diamonds. Gardner’s spray-painted miniature size sculptures were also showcased at the trunk show. From these pieces of artwork, we see where the inspiration for Creature Couture was derived. “Edgar” for instance, is a rather playful owl-monkey hybrid. His mischievous skull-face can be seen on gold plated brass rings in two types: blue or purple ruby eyes depending on his mood. “Macy,” another skull ring, is an unfortunate soul whose head is impaled with a mace, while “Charlie” – who can be strung on a chain necklace – meets a similar fate with an axe. Gardner’s signature logo ring, with the mouth of a skull forming the word “Heidi,” represents how the wearer can hint at her secret dark side. Pieces for men include “Hobart,” a quirky top-hat wearing cufflinks with bones that double as bow ties. Ancient armor and weaponry – in the forms of silver and brass shield earrings, and spear rings – appeared in another collection called Amour D’Armour.